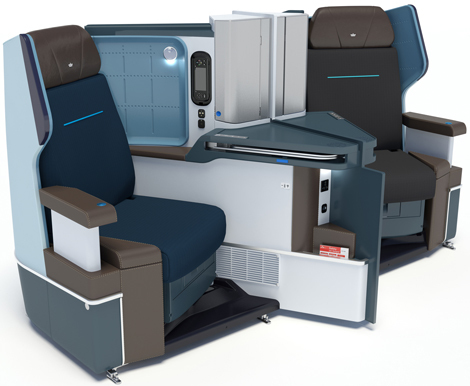 KLM will install its new World Business Class seats on to its forthcoming B787-9 aircraft. 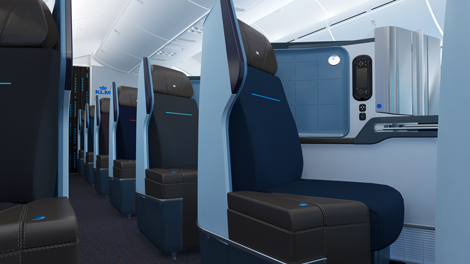 The Dutch carrier, which is due to take delivery of its first Dreamliner later this year, said the seats will be fully-flat, have direct aisle access and feature 16-inch in-flight entertainment screens. Business class will be configured 1-2-1 while economy will have a 3-3-3 configuration with seats that recline 40 per cent more than currently and have an 11-inch IFE screen. There will also be the option to “communicate via Seat Chat with fellow passengers who are not seated nearby”. KLM is also launching its onboard wifi, available in all classes, on the B787-9. The airline will operate its first B787-9 to Bahrain, Cairo and Xiamen (see news, February 11). Last week, Air France-KLM announced it will make further cutbacks of €300 million after making a net loss of €79 million in the second quarter (see news, July 24).